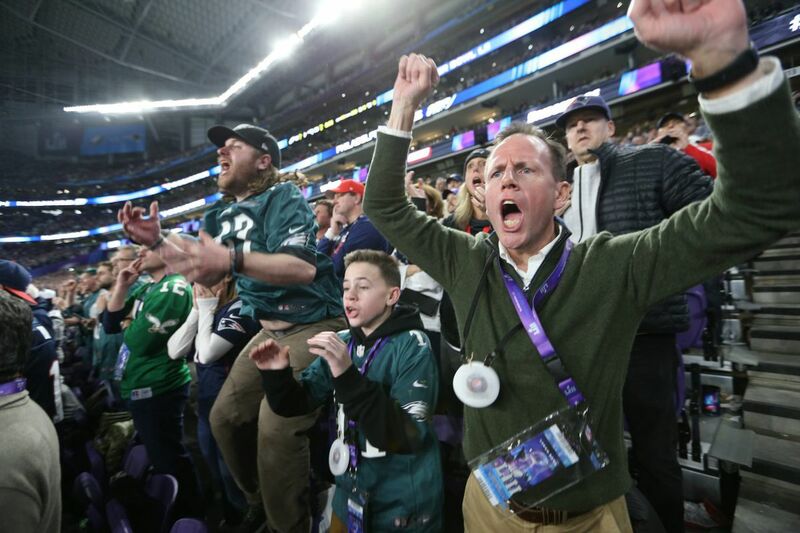 Dave and his Son Kevin Greed, react to an Eagles win over the Patriots at the Super Bowl LII, at U.S. Bank Stadium in Minneapolis, Minnesota, Sunday, Feb. 4, 2018. Nick Foles continued his playoff magic. He completed 28 of 43 passes for 373 yards and three touchdowns. He also caught a touchdown pass from tight end Trey Burton. Foles completed 11 of 14 third-down passes for 169 yards and two touchdowns. In three playoff games, Foles was 26-for-32 on third down. LeGarrette Blount and Jay Ajayi combined for 147 yards on 23 carries. Blount scored his second playoff touchdown on a 21-yard second-quarter run with the help of a big block from tight end Brent Celek. Third-down back Corey Clement had four catches for 100 yards, including a 56-yard catch-and-run on a wheel route that set up a second-quarter touchdown. Both teams tried trick pass plays in the first half. The Patriots had wide receiver Danny Amendola throw to Tom Brady, who was wide open. But the ball went off his fingertips. Late in the second quarter, the Eagles had tight end Trey Burton, who played quarterback in high school and briefly at the University of Florida, threw a one-yard touchdown pass to Foles with 34 seconds left in the first half to give the Eagles a 10-point halftime lead. The Patriots scored on their first three possessions of the second half and took a 33-32 lead. The Eagles came right back and took the lead. Then, on a second-and-2, Brandon Graham came up with one of the biggest plays of the game, stripping the ball out of Tom Brady's hand. Derek Barnett recovered and the Eagles ended up getting a Jake Elliott field goal to take an eight-point lead with 65 seconds left. Safeties Rodney McLeod and Malcolm Jenkins made it clear early that the Patriots had better make sure their chin straps were buckled. McLeod flattened Brandin Cooks when he tried to leap over him on an end-around on a third-and-2 play early in the second quarter. On the Patriots' next possession, Malcolm Jenkins flattened Cooks, the Patriots' best deep threat, knocking him out of the game. That left the Patriots with just three wide receivers.